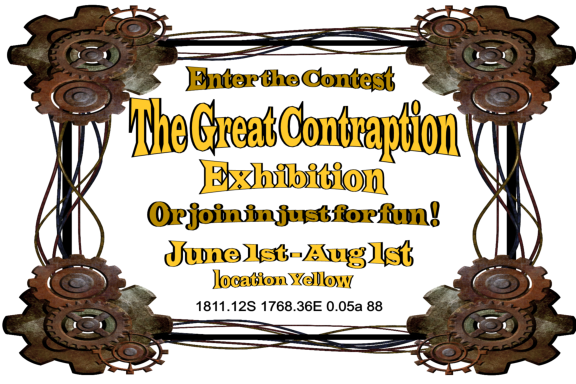 The Great Yellow Contraption Exhibition! 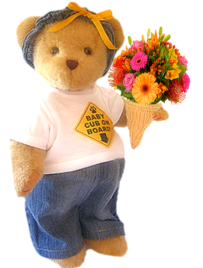 Yes, the rumors were indeed spot on as Chloe was seen at the Farmers Market in the village buying flowers and very much expecting. It seems from my sources that she was off to visit her husband, one Rufus Alan Fuzzybottom, who is being treated at the Admiratio Clinic. It seems had some sort of an accident when he head the news they were expecting. You know I will keep my ears open for any new developments. 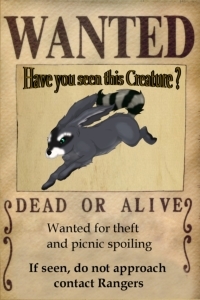 The picnic basket bandit has been sighted, but not caught. Check the poster and keep an eye on your food! Over thirty AW citizens danced the night away at the YG's anniversary dance. Our thanks to Doc1 who provided a superb venue and to Class3, Veger and PKTunes for their always outstanding music. The Great Yellow Contraption Exhibition Coordinates are: Yellow 1811.12s 1768.36e 0.5a 88. The Yellow Gazette staff have been working day and night in preparing the grounds for the first ever Contraption Exhibition in Yellow, so that builders of all experience levels can work on something that will inspire and challenge them to try new things. Contraptions of any sort, from fountains to airships; it's just about imagination and fun making mechanical contrivances, gadgets, devices; the more wild a thing the better. It's about making the ordinary extraordinary. The YG staff has got considerable feedback on what the contest could be, and after reading and listening to all who participated, the idea of the Contraption Contest was a blend of the best. 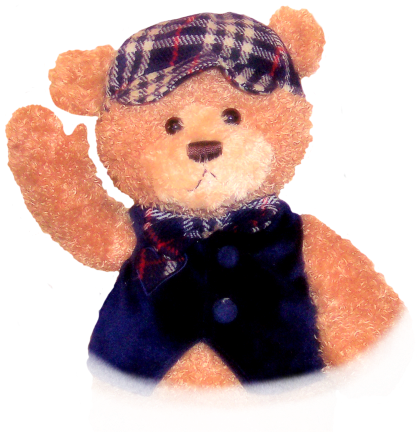 The contest will begin on 1st June 2011, and will continue before closing on 1st August. That will give contestants about 60 days to come up with some inspired, mad, and clever stuff. It's important to remember that this doesn't have to be complicated, it's meant to stretch the creativity, and make use of the AW tools builders can use. And above all is about having fun. The contest will be judged on 5 criteria, using a 3 point scale for each. The person with the highest score will win the contest. 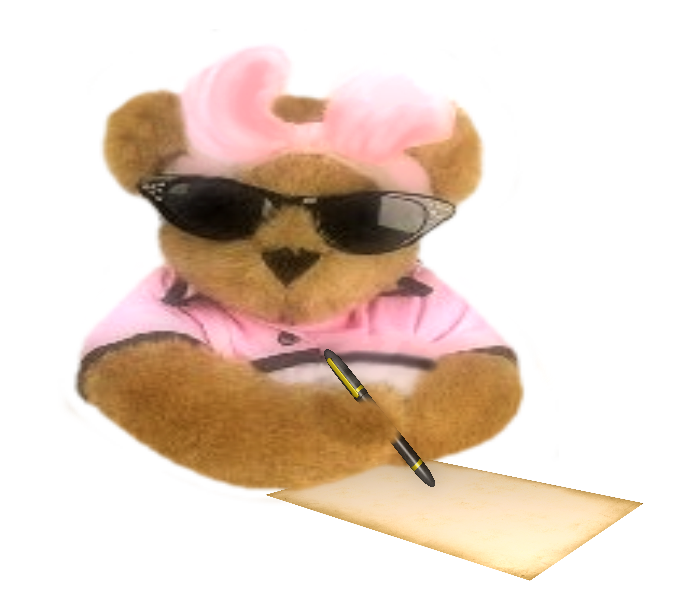 Builders should contact either Apooka or Ozman by telegram, and they will provide a lot in the contest area. The coordinates for the exhibition area are: Yellow 1811s 1771e 0.5a 90. Yellow has very good object, texture and AV sequence yards which will provide contestants with plenty to work with. 1st place: 1 year citizenship AND from AW itself, a P30 world. All contestants who complete their build on time will be granted V4 rights in Yellow. The prize winners will feature in the Yellow Gazette. 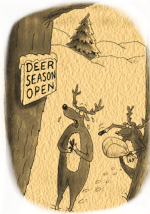 Let the hammering, banging and creativity begin! John decided life would be much easier if he had a clone. So he had one made and sent him to work in his place while he stayed home and relaxed. Soon this backfired when the clone came home and said he'd been fired for making sexual comments to the women in the office. John decided, he had to get rid of his clone before things got any worse. John took his clone to the top of a tall building and pushed him off. Unfortunately, someone saw John and he was arrested and convicted for making an obscene clone fall. OzySEO's physics work is featured in June's Building Tips page. His physics lab is well worth a visit to get some insight on how to use this very powerful set of commands. 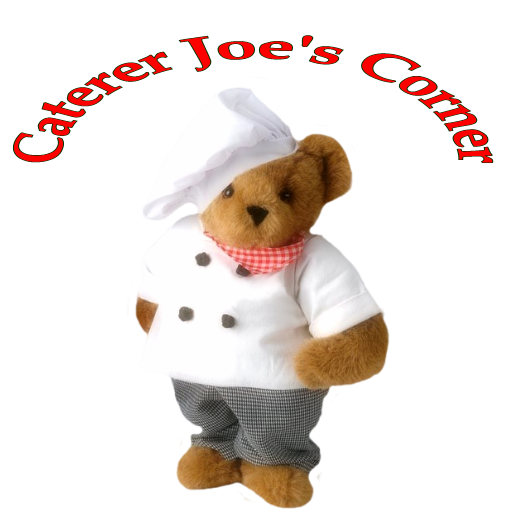 Caterer Joe is hard at it in the kitchen and we feature another one his fantastic recipes. 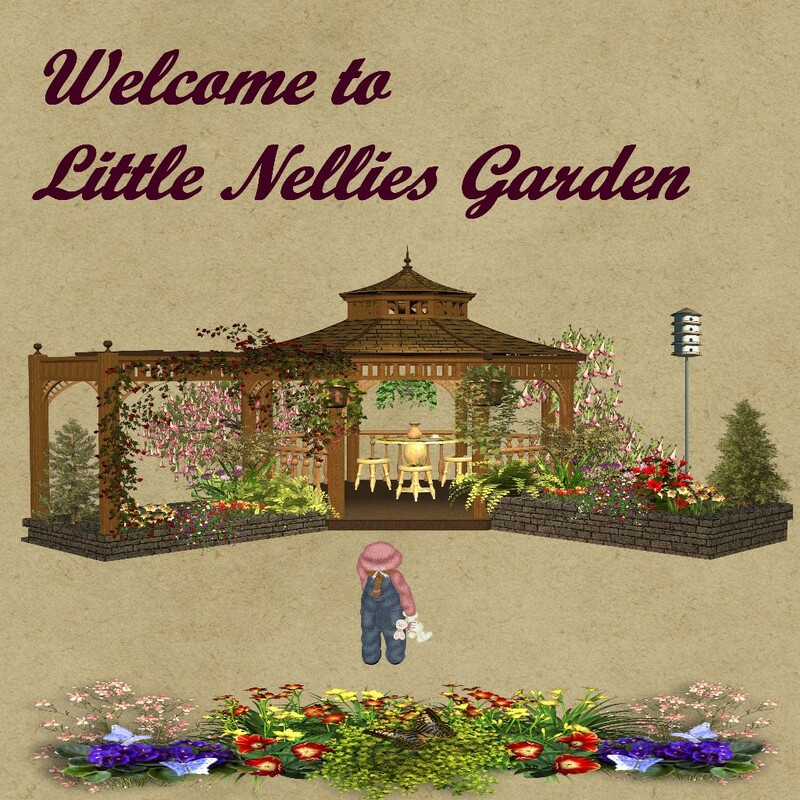 This month's features in Little Nellie's Garden are some more spectaculat plants for you to use. Fuzzy and his gang are still going strong, working for the Gazette and still getting into the odd scrape. On a lightly floured surface, unroll pastry. Transfer to a 9-in. pie plate. Trim pastry to 1/2 in. beyond edge of plate; flute edges. Line unpricked pastry with a double thickness of heavy-duty foil. Bake at 450° for 8 minutes. Remove foil; bake 5 minutes longer. Cool on a wire rack. Reduce heat to 350°. In a small skillet, cook the bacon, onion and red pepper until vegetables are tender; drain. Stir in spinach. Spoon spinach mixture into pastry. In a small bowl, combine the egg substitute, cottage cheese, Swiss cheese and seasonings; pour over spinach mixture. Bake for 35-40 minutes or until a knife inserted near the center comes out clean. Let stand for 10 minutes before cutting. Serve with sour cream. Yield: 6 servings. 1 piece with 1 tablespoon sour cream equals 278 calories, 12 g fat (5 g saturated fat), 22 mg cholesterol, 659 mg sodium, 26 g carbohydrate, 2 g fiber, 17 g protein. Diabetic Exchanges: 2 lean meat, 2 fat, 1-1/2 starch.